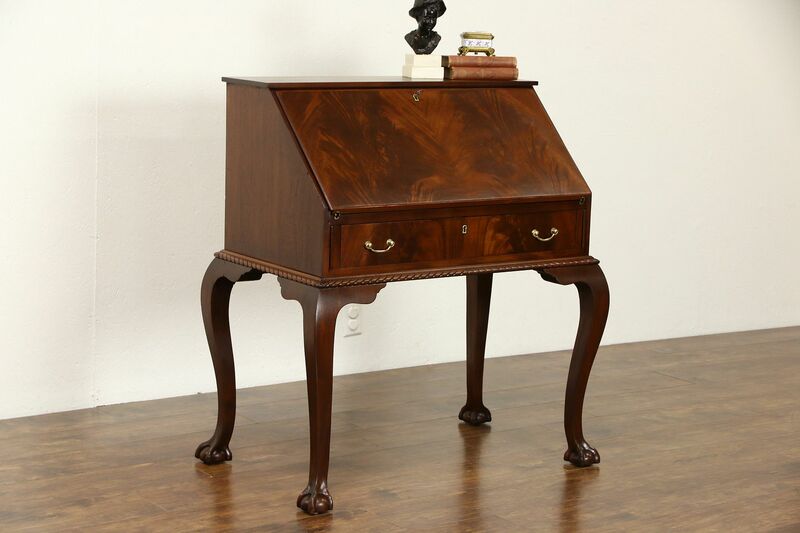 Carved of mahogany in the 1940's, a secretary desk has traditional claw and ball feet in the Georgian Chippendale manner. The restored finish enhances beautiful matched flame grain panels. American made vintage furniture, there is no signature remaining. A key locks the drop front which rests on automatic supports. Inside are tiny compartments and drawers for documents. The large lower drawer has dovetailed joints. Solid brass hardware is original. Dimensions are 36" wide, 22" deep, 39" tall and the desktop is 28" high.